How often do you stand at work? Have you ever wondered whether if sitting all day is healthy? Recent Studies show it’s important to stand more often and sit less. A standing desk may be the best solution to compensate for the negative effects of sitting all day. Read on to learn five reasons why you should consider a Sit-Stand-move about desks. According to a study, lack of exercise increases the risk of a number of health conditions, including heart disease, cancer and type 2 diabetes. But, we believe that you can avoid that by incorporating movement into your daily activities. The benefits are many, including improved health, more energy and better collaboration. Increased Energy & Productivity – Standing and moving have been associated to increase in energy levels. When you are standing, you’re more productive and focused for longer periods of time because standing keeps the mind alert and engaged. Creativity – Standing helps the blood circulation and respiration which leads to an increase in productivity and concentration. And, you naturally become more creative. Improved Collaboration – The body position is more open while standing rather than sitting, it’s more likely to engage with others. A study reveals that standing while working in a group encourages people to work together more creatively and collaboratively. It allows employees to brainstorm aloud, making it easy to share ideas with colleagues and eliminating the need to email back and forth..
Health – There is no shortcut to better health, the key is to find a healthy balance between sitting, standing and moving periodically. A great first step is to invest in a sit-to-stand. And, the addition of short walking sequences and regular exercise to your day can really make a difference. Better Posture & Ergonomics – Standing helps align your body. However, you must be careful that you do not end up leaning too much when standing and working. It’s important to focus on having a straight back with your knees slightly bent. However, it can be a pain as well to be on your feet all day. Therefore, it’s also important to mix seating, standing and walking during the day. Boss’s Cabin new line of Sit-Stand adjustable tables has the features needed to get standing in the workplace. 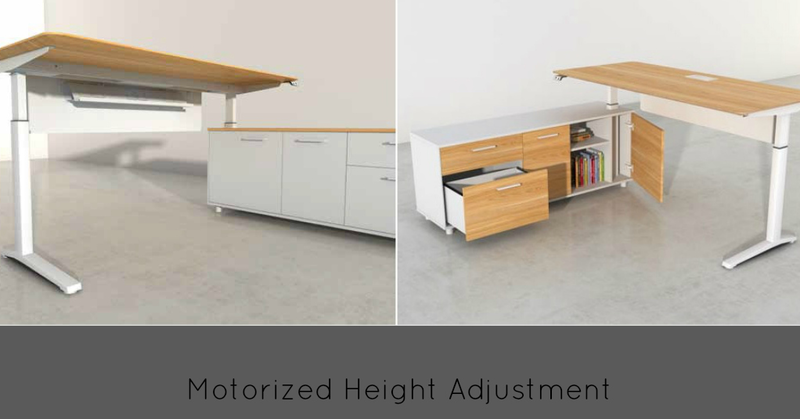 Our motorized height adjustment desk allows users to easily adjust positions throughout the workday, switching from sitting to standing in just seconds. Users of our standing desks reported less back and neck pain, better posture and more energy during the day. Start taking a stand at work. Increase productivity, increase creativity, live longer and work injury free.